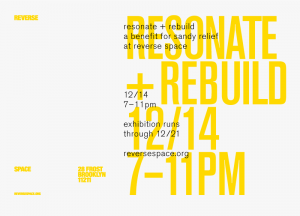 REVERSE and Aurelio Trinidad Valle present RESONATE and REBUILD, a silent art auction benefit and exhibition at REVERSE space at 28 Frost Street in Williamsburg, Brooklyn, that will open on Friday, December 14 from 7-11 PM with works remaining on view until Friday, December 21. 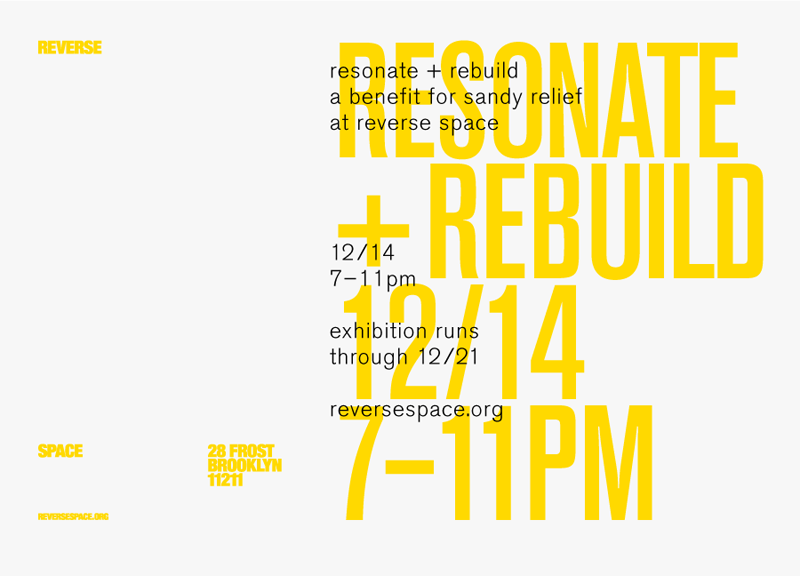 The focus of this benefit is to raise funds for the Rockaway Waterfront Alliance, an organization dedicated to rebuilding one of the most severely affected communities by Hurricane Sandy. REVERSE is delighted to include a portfolio of art prints for the silent auction called the “Peace Prints”, originally made in 1972 for the McGovern campaign. These prints will be available for bidding during the benefit exhibition, made possible by Patty Mucha and Julie Martin. Artists who participated in the “Peace Prints” series include: Claes Oldenburg, James Rosenquist, Richard Anuskiewicz; Oyvind Fahlström, Marisol, Robert Whitman, and Jack Youngerman. Artworks that have been donated to the exhibition alongside the Peace Prints include works by JG Thirlwell, Nick Zinner, Sebastian Mlynarski, Gabriel Shuldner, Erik Foss, Ben Brock, Alberto Cortes, Richard Alvarez, Damian Genuardi, a collaborative work by Brandon Friend + Jason Douglas Griffin and many more. All works will remain on view and those that are not sold during the opening event will still be available for bidding at REVERSE until Friday, December 21, 7pm.